Four thousand years ago the ancient Egyptians were using hearth sticks to light their domestic fires. This long history of friction fire lighting continues to the present day, through Tamil Nadu fire drills and the foot-powered drills used by the Lhota Naga people in India. The average Masai warrior won’t just hunt his dinner, he’ll use friction fire lighting to cook it – a skill that most modern people have never developed. Fire lighting has become easy: matches and lighters make it straightforward to start a blaze wherever we are, but suppose you didn’t have the necessary supplies to hand? Learning how to light a fire with only naturally available materials is not just a life skill, it’s a superb way of exploring how your body functions, because it requires using tiny motor skills that many of us lost sight of when our playground days were over. This combination of skills, expertise and selection of materials is called bushcraft and it’s what we specialise in teaching. Our fun and relaxed environment in the beautiful countryside of Dorset and Hampshire makes a great natural classroom. Joining us for a bushcraft course will give you an amazing insight into how our environment can provide us with everything we need to survive, even if our modern lives have not given us the chance to develop key bushcraft skills. Learning to make fire is what separated the human from the animal, and may have led to all the great innovations our race has made since, from developing language to landing on the moon! Wildway Bushcraft can teach you how to prepare and use a fire starting bow drill in a single day – so that you can experience the thrill of creating fire from nothing. A bow drill is the most efficient tool for friction fire generation, and we’ll teach you how to select the right materials such as Hazel and Ivy which occur naturally in the wild and are easy to work with. There’s no point developing a skill that you couldn’t actually use if necessary, so we focus on teaching with commonly available native trees and plants. We teach you how to identify the right wood, what the difference is between standing and lying dead wood and why it matters to your fire-starting abilities and how to make a spindle and a hearth from dry dead wood to maximise your ability to create fire. After that we help you determine how to measure your bow and which woods to use to make it strong but light, so you can operate it for the necessary length of time. Making a bearing block and gathering tinder are also key skills and help you build your aptitude for basic natural engineering and foraging. Is it starting to sound complicated? It’s not. Our expert survival skills tuition will help you find your feet in the wild and our bushcraft students find they easily come to grips with their surroundings and find ways to use what nature provides, including their own bodies, you’ll find the same as you develop your own bushcraft skills. 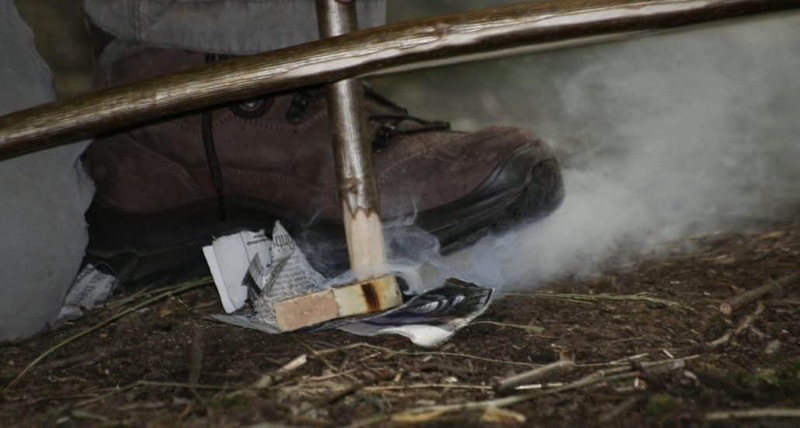 Why not call us today to sign up for one of our friction fire lighting days?